Although quiet at the start of summer, Northland’s rural property market picked up somewhat post-Christmas. Values of dairy farm transactions were consistent with similar properties sold last season, and interest was shown by both local purchasers and those from outside the region. As in other regions, plenty of rain provided abundant feed and, although demand for sheep and beef properties is reasonable to strong, listings are in short supply. Northland’s autumn property activity is therefore likely to remain steady, rather than spectacular. With buyers evident, albeit cautious, those considering taking property to the market, particularly fattening farms, should expect a positive response, as long as they are realistic about values. One autumn listing sure to attract attention is a well-located and widely admired 159 hectare Waipu beef finishing unit selling for the first time since 1853. Seventeen Waikato dairy farms sold during November 2017, close to the record number for the month in any recent year. After that, however, summer sales activity in the region reduced considerably. Various factors contributed to this, including doubt around the new government’s intentions relating to overseas ownership, and uncertainty on where the dairy payout will end up this season. While farms at the top end of the region’s market continue to sell well, at prices considerably above where they would have been a few years ago, there is little interest in those properties with less obvious appeal. Waikato dairy farmers who want to buy have already done so, while the others are more focused on paying back principal and interest than increasing their landholdings. Any possible market change during the autumn will be gradual rather than dramatic. Kiwifruit, particularly orchards growing the G3 variety, set the tone for the Bay of Plenty’s rural property market, and demand currently outstrips supply. Groups of buyers are coming together to achieve some purchases. Sales exceeding $1 million per canopy hectare occurred early in the season. In prime kiwifruit country, a Paengaroa dairy farm is for sale, currently worth approximately $45,000 per hectare, though with around 60 per cent of its area suitable for kiwifruit, the latter is valued at $100,000 per hectare, this prior to any development or planting. Meanwhile, interest in dairy property, keen pre-Christmas, dropped away in the new year; a Rotorua hill country property sold for $11,700 per hectare; and there is some interest in forestry blocks following the government’s announcement on forestry development last year, though this will take some time to transition to sales. Rural property sales in Taranaki and Wanganui were limited through spring and summer, particularly sales of dairy farms. Farms in less admired regions are attracting few prospective buyers. Several spring campaign listings remained unsold through the summer and, where dairy property is concerned, it is a buyer’s market. Taranaki dairy farms that did sell achieved prices between $40,000 and $45,000 per hectare. With financiers taking a conservative line on lending criteria, and a degree of uncertainty among farmers around consenting issues for dairy, the market is unlikely to accelerate during the autumn. As always, properties with scale and location are the exception to this trend, and will continue to sell well. 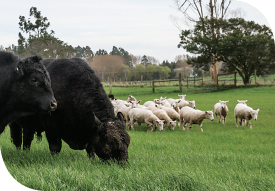 At present, that is particularly apparent for sheep and beef farms, where an undersupply of good quality properties for sale is evident throughout the region. As elsewhere in the country, Wairarapa, Manawatu and Horowhenua dairy farm listings remain abundant. Those properties regarded as marginal for dairy, or carrying challenges around environmental compliance and consenting, are struggling to attract buyers. Meanwhile, listings of sheep and beef farms are tight so properties with scale and location are selling well. One such farm, Allandale, an admired 393 hectare Greytown grazing property, sold as two blocks at the end of November. These comprised 75 hectares to a local dairy farmer for use as a run-off and dairy support property, and the 236 hectare main block, which sold to a neighbouring dairy farmer, who will integrate this into his own property. Each block sold for approximately $26,000 per hectare. A large north Wairarapa hill country property is likely to go to the market in autumn and will attract considerable interest. With plenty of feed available, summer activity around Hawke’s Bay rural property was buoyant. A shortage of listings was the only factor holding back the market. Those farms that were offered for sale sold well. Demand for sheep and beef properties of 550 hectares or more is particularly evident, and remains unmet. Transactions during the summer remained firm at up to $1400 per stock unit carrying capacity or from $10,000 per hectare up. Since the election, enthusiasm from overseas investors has waned, though some are determined to follow through on their intent to participate in the Hawke’s Bay rural economy. While they are now likely to face higher barriers, they appear to still have opportunities to make an acceptable business case to the Overseas Investment Office, particularly around forestry property and development.